This project is not currently active. The back-end is still running (for now) for hobbyists and people interested in running the software, but it is not working on anything significant. NB: the main write-up of the project and its results is in Chapters 7 and 8 of my thesis. 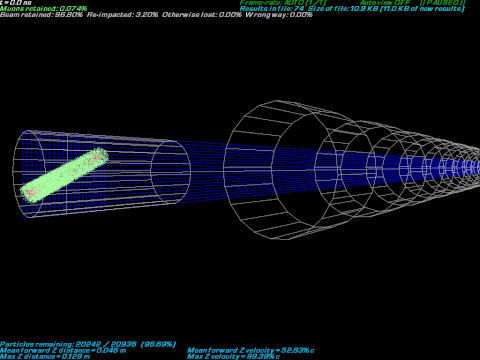 Here you can use your own PC's idle time to simulate and design parts of a particle accelerator. Simply extract the (full version) archive below to a folder on your disk, create a user.txt file with your name in it and put a shortcut to muon1_background.exe in your Startup folder if required. For Linux, good results can be achieved running Muon1 under Wine, available via MacPorts or Fink for the Mac. Use 7-Zip to open .7z files, WinZip files (less compression) provided for compatibility. Muon1 for Windows (.7z file, 1668KB; Zip file, 1882KB). Modifications made and previous versions of the program. The progress Muon1 users have made so far. Find out more about the project, includes internet links. Discuss things, report bugs, ask questions etc. Lists tasks the network is currently optimising. Successive writeups and presentations of the research. Multiple FTP servers share the bandwidth. Results2CSV - Commandline tool to convert result files into CSV format for analysis in other programs. Muon Results Viewer and its successor Muon Cockpit by [SG]Herb - A flexible Windows tool for manipulating and sorting Muon1 results. MuonPlayer - Plays back animation files recorded by Muon1, if the '.anim' extension is assocated with 'muonplayer.exe'. 100-result sample file for optimisation Linac900Ext8Xc3 (text file, 101KB; binary file, 20KB). Updated 2019-Apr-21, 16:49 UTC. 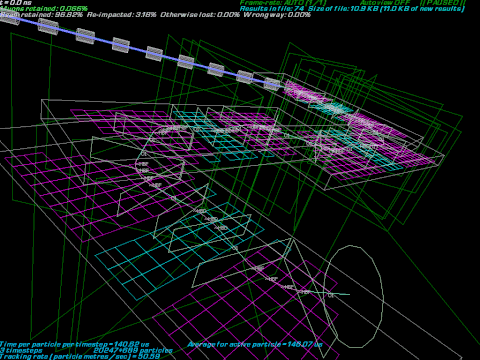 Above: The Muon1 main simulation. 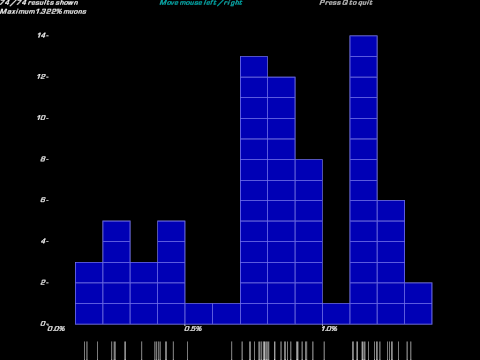 Below: The results histogram from muon1viewresults.exe.